A meeting was held of Lay Consultants throughout the Institute at the General House in Rome, brought together by the International Laity Commission. The purpose of the meeting was to listen to Marist laity engaged in animation in their desires and needs of support and to ask for their advice in how we proceed on our common journey together. We also asked them to look at the plans and tasks of the Laity Commission and to give us feedback on them. 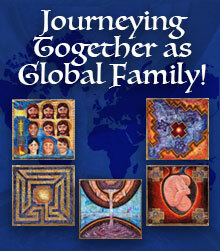 The Lay participants came from 10 Marist Provinces on the 5 continents. *	Americas: Joe Reganato (USA), Claudia Rojas (Norandina), and Edison Oliveira (Rio Grande do Sul). They joined Brothers Pedro Herreros, Chair of the Commission, Emili Turu and Antonio Ramalho, Councilors on the Commission, and Michael Flanigan, Secretary of the Commission. The days were full of shared information. On Thursday, we heard a little about each of the participants and their involvement in their provinces. Much of that first day was given to background information: the tasks which we hoped to accomplish during the days together, the Action Plan of the Commission and the calendar of tasks. We also listened to the realities of mission in the Marist World through a power point presentation, to gain a global understanding of the Marist Presence in the world. The next day, the participants shared the realities of their own provinces, and where possible, their region. We then broke into small group discussion by language group. We also heard the results of the Questionnaire on the Laity that was sent to the provinces in 2004. On Saturday, we concentrated on three major themes which arose from the group, as well as from the questionnaire: Programs for Lay Formation, Marist Lay Identity and Belonging and Marist Spirituality (ChMMF). There were short presentations on these themes by 3 of the participants (Marta, Anne, and Claudia, respectively) with a group discussion about these topics based on the participants understanding and the reality of their province. Of course, the Marist charism was alive and present by taking a little time from our work on Saturday night, and venturing up to the hills of Frascati to enjoy some wine, porchetta, and pizza. In addition to the work of the 4 days, strong bonds were forged among the participants. Brothers and Lay people together in mission was not just a topic being discussed, but a lived reality. Each of the participants felt a strong sense of belonging and being MARIST by the end of the weekend. In his remarks at the end of the meeting, Bro. Sean Sammon told us, The foundation of partnership between Marist laymen and women and Marcellins brothers lies in the common mission and prophetic call that we share as a result of the sacrament of baptism. 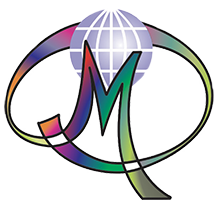 Partnership runs much deeper than participating in a common work; it is about the sharing of faith, being in love with Jesus Christ, and the collective experience of having Marcellin Champagnat capture your heart and seize your imagination. Vatican II was a defining moment for Roman Catholic laity as well as men and women religious. The Councils proclamation about the universal call to holiness, addressed to both groups, was an unambiguous statement that all Christians are baptized into mission: the mission of proclaiming Gods Kingdom and its immanence. Prior to the Second Vatican Council, laymen and women were viewed almost entirely as helpers to the Churchs true servants: bishops, priests, and religious. The thinking went like this: since they have no mission themselves, they were permitted to assist those who did. Central to the Churchs mission is prophecy. Called by God, prophets are sent to remind us about his saving interventions in the past, challenge us to conversion in the present, and urge us to build up a new human community as God promised. As a result of the Council, laymen and women moved from the role of helpers to that of full partners in mission, including its prophetic role. Prior to the Council religious life was also in a very different place than we find it today. Retrospectively, consecrated lifes pre-conciliar identity looks rather elitist: it was set up as a closed society with the pursuit of individual perfection given most often as its reason for existence. Those among us who passed through a novitiate experience prior to the mid-1960s might remember learning that the purpose of the Institute was the glory of God and the sanctification of its members. This description was followed by a statement about our works, the specific apostolate for which we were founded. In our post-conciliar Church religious life is no longer presented as a state of perfection as such but rather as one way in which believers can grow in love and holiness. Furthermore, the following of Christ is seen more clearly as the ultimate norm and supreme rule for all religious communities rather than adherence to some list of regulations. The foundation of partnership between Marist laymen and women and Marcellins brothers lies in the common mission and prophetic call that we share as a result of the sacrament of baptism. Partnership runs much deeper than participating in a common work; it is about the sharing of faith, being in love with Jesus Christ, and the collective experience of having Marcellin Champagnat capture your heart and seize your imagination. All of this should come as no surprise. As mentioned earlier, among the many gifts of Vatican II was this realization: Marcellins charism is a gift for the Church and not just for his brothers. Consequently, when it comes to the founders spirituality, many laymen and women challenge the notion that it is the brothers alone who have a chest containing that treasure, and that during this time in history, they are willing to share it with their lay colleagues. 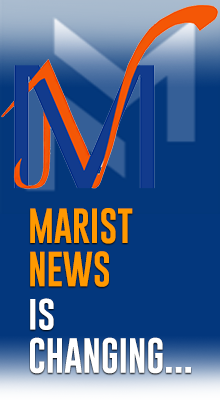 Each and every Marist lay partner has his or her own life story to tell, has made his or her own journey of faith, and has his or her own unique experience of the founder and his spirituality. The same is true, of course, for each of Marcellins brothers. If we were to listen to all those stories, hear all these tales of faith, and come more fully to appreciate the many experiences of Marcellin and his spirituality that exists among us we would be better able to share what we hold in common and respect the differences that exist between the identity of one of Marcellins brothers and that of a Marist layman or woman. Ongoing collaboration between religious and lay women and men witnesses to the fact that our Church is capable of an ecclesiology of communion. Today this witness is more important than ever. All too often, past Church actions betrayed a power-controlled ecclesiology-an outcome antithetical of Gospel principles. As Marcellins brothers and lay partners sharing a common charism, we must, through our life and work together, bear witness to the fact that it should and can be otherwise. With that said, we must also admit that in our efforts to clarify the identity of brothers and Marist lay partners we inevitably realize that while a great deal is shared in common, differences exist also. This understanding is in keeping with an ecclesiology of communion that emphasizes different roles as part of the fundamental equality that stems from our common baptism. Some among us, though, are uncomfortable with any talk about differences. They express concern that the word difference may come to mean more than it implies, that it will beg a comparison. To deny differences where they exist, however, robs us all of the unique and complementary nature of both brothers vocations and that of the Marist layman or woman and undermines our ability to arrive at a clear understanding about the identity of each. My own belief is that Marist partnership is a coming attraction of what the Church of the future will look like. We must work together to become the Churchs living memory of what it can be, what it longs to be, what it must be. These days together have been rich indeed. I offer a personal word of thanks to each of you and the thanks of the Council for all that you have shared over many long hours of work, and even during the free time that have been available. Every journey of a thousand miles begins with the first step. And while there have been other beginnings this one is significant at the level of the Institute. Lets work together to insure that when the history of this period is written this meeting will be remembered as having been a new beginning, a very important step in the continued growth of partnership between Marcellins brothers and Marist laymen and women. A word of thanks also to Pedro, Antonio, Emili, and Michael for organizing this meeting. There are always a thousand and one details to attend to and I am grateful that all has gone so well. Finally, a word of thanks to those who have helped us communicate, Miguel Angel and Teofilo, our translators. Their role here can never be underestimated; without them there would be no meeting. So many thanks again. We need to make our own the mind and heart of that simple country priest and Marist Father who is our founder. Marcellin dreamed very large dreams, indeed, and because of his faith in God and confidence in Mary had the zeal to make them happen. If you have had an opportunity to visit LaValla you have some sense of his courage. What is today a museum and called the cradle of the Institute was, in his day, a house in need of repair. Just shy of 28 years of age, and with that old house and two recruits he set out to found an Institute that today includes brothers and lay men and women bringing Gods Good News to poor young people in 76 countries. The founder would be stunned by the resources that we have on hand today for mission. He would, I believe, also lose his patience with the prophets of doom in our midst. He could not have imagined that his dream would grow the way that it has. So, lets be up and doing. Our mission today is urgent; the need for zeal in carrying it out evident. Let us pray for the grace to have the courage to rise to the occasion together. Thanks again.